Вземи само за 114.14 лв. Вземи само за 108.35 лв. D-Link DWS-3227 Managed 24-Port Gigabit Stackable L2+ Wireless Switch with 4 Combo SFP, 1 Fixed XFP Slot, 2 10-Gigabit Slots, and 10-AP License. 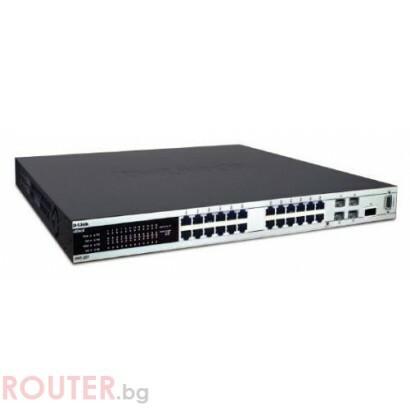 D-Link DWS-3227 ‘Wireless-ready’ Switching for Seamless Roaming and Centralized AP Management, 24 10/100/1000 Ports with 4 Combo SFP in 1RU Chassis, Built-in XFP Interface and Optional 10-Gigabit Stacking/Uplinks, Preconfigured ACLs Protect against Trojans, Worms, and More.